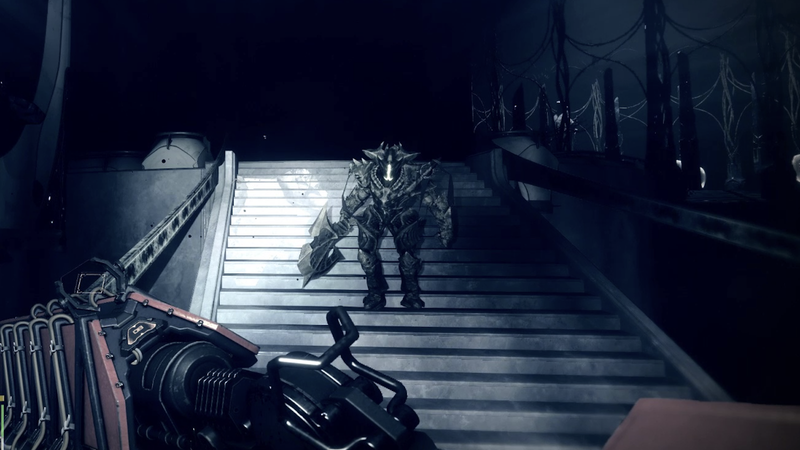 Why hello there, actually scary Destiny 2 monster. Last night, with the help of the Internet, I found and completed a harrowing challenge in Destiny 2’s new Forsaken expansion. I wasn’t supposed to be powerful enough to do it, but after some creative trial and error, I found a way. Just a note up front that this post involves discussion of late-game areas and mechanics in Destiny 2: Forsaken! I will not directly spoil any specifics from the story. Consider yourself warned. Forsaken has mostly been described as a tale of revenge. 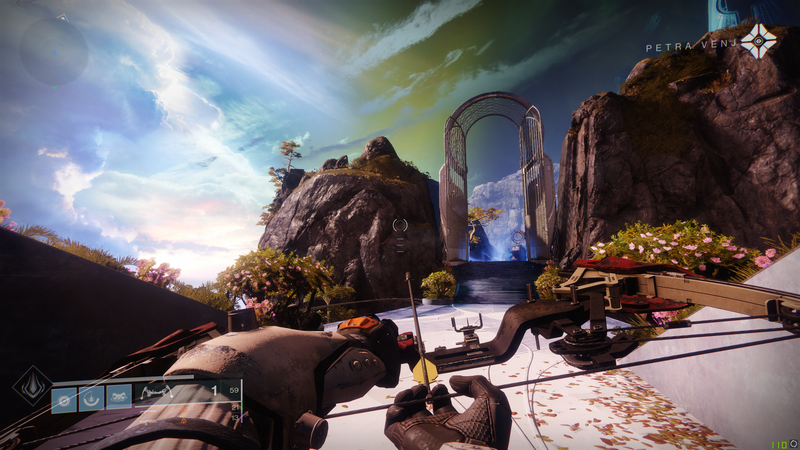 Your Guardian sets out into a new patrol space called The Tangled Shore in order to avenge the death of Cayde-6 at the hands of the Awoken prince Uldren. And while that is indeed the “main” story of Forsaken, the actual expansion is a lot bigger and more mysterious than that, both in terms of narrative scope and geographic size. 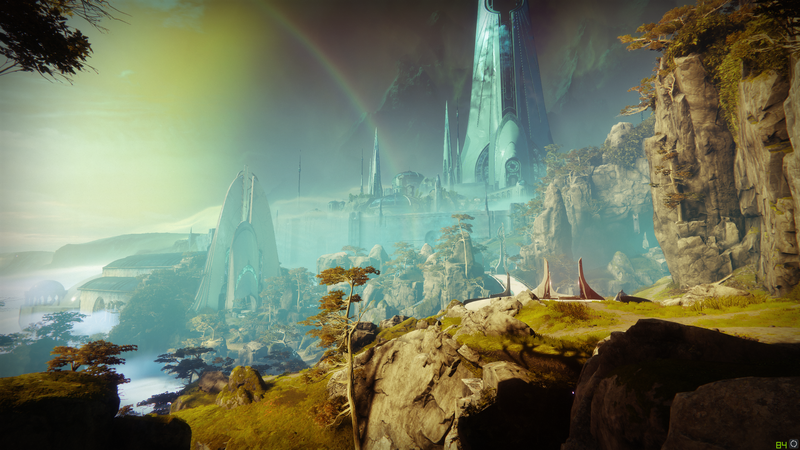 The story of Uldren, Cayde, and the Tangled Shore is more of a first act setting up a broader narrative that takes place within a mystical interdimensional puzzle-box called the Dreaming City. I’ve been poking around the City for the last day or so and have been really enjoying myself. As I arrived at the Dreaming City, a mysterious NPC warned me that I would find no guides here. So far Bungie has held to that pledge. I’ve found weird metal rods that occasionally activate for reasons I can’t determine, and I’ve found power-orbs with no clear purpose sitting in small containers. I’ve found chests locked with mysterious poems, and I found a little cat statue, to which I traded a “small gift” in exchange for some armor. But nowhere have I found a tutorial, or any explanation of what I’m supposed to do. My character’s Power level is currently a little above 500, which is the soft cap at which your progress slows down. Everything in the Dreaming City is above 500 power; most events are in the 530-540 range, which is well out of my league. If I go up against a 550-level enemy, it often can kill me with a single shot. I’m hopelessly outmatched by even the lower-level mobs and bosses I come across. Of course, that hasn’t stopped me from exploring. I generally try to avoid looking up solutions and tips for Destiny secrets, since it can be so much more rewarding to find things on my own. But after a few hours of exploring and experimenting in the Dreaming City, I decided to head over to the Internet and let myself look up one thing. I had a bounty that required me to complete an “Ascendant Challenge.” What was that? How could I complete it? I had to know. Over at the lively Destiny subreddit, I found that a poster named MrWhizKid97 had shared a guide on “how to easily complete your first Ascendent Challenge.” I temporarily swallowed my no-spoiler policy and read the post, then went and followed the included instructions to the letter. What happened after that was easily the strangest and most harrowing thing I’ve done in Forsaken, and I’m glad I took the time to look it up. The first thing I had to do was take some drugs. 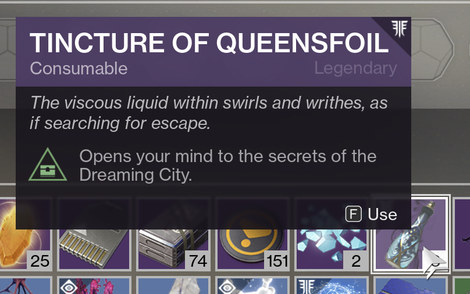 While completing events in the Dreaming City, you’ll occasionally be rewarded with a consumable called “Tincture of Queensfoil.” Its item description is purposefully vague, saying only that using it “opens your mind to the secrets of the Dreaming City.” Following MrWhizKid’s instructions, I took some Tincture and headed into the Lost Sector dungeon located under where Petra Venj, your Dreaming City contact, stands. I had now “become ascendant,” the game told me, without explaining what that meant. I assumed that my character was now tripping balls. I fought my way into the Lost Sector and, a little way in, found that I could now see a huge black portal floating in the sky where before there hadn’t been one. I ran forward into the portal and was transported into a dark arena. I figured I must be in the Ascendant Realm, a dark dimension that works kinda like the Destiny version of Stranger Things’ Upside Down. A huge Hive Knight teleported into the space in front of me. To each side of me, catwalks stretched away toward floating platforms, all suspended above a bottomless chasm. Everything was covered in darkness and fog. Remembering the instructions in the post, I turned and made my way away from my starting point, toward a Taken Blight that I could just make out in the distance. I couldn’t really see where I was going, and began to jump around half-blindly. I was being chased by shadow Thrall who were so much higher level than me that they had skull marks next to them. One of them hit me and took off a huge chunk of my health. Additional Knights began to appear. I could hear them coming for me. Seemingly everywhere I turned, I found myself face to face with one. I was going to have to keep moving, because a single hit from one of these enemies could be enough to finish me off. I got the four Blights cleared, then jumped to the center platform and began running in a circle, avoiding enemies while clearing out the white crystals. I was doing pretty well, then I got killed by a stray Knight attack. I got bounced back into the Lost Sector with nothing to show for my work. Fortunately, the Tincture was still in effect, so I could still see the portal. I tried again… and fell to my death while jumping into the darkness between the Taken Blights. I died a few more times after that, usually by falling. I kept trying, though, growing used to the nightmarish tempo of the encounter. It was largely silent in there, aside for the screaming of the Thralls and the steady stomp of the pursuing Knights’ footsteps. I realized I was hunching forward over my mouse and keyboard, sitting with my shoulders up by my ears. I forced myself to relax. Eventually, I blew up the last crystal and completed the challenge. All the Knights disappeared, and I could breathe easy. I cracked open a chest, completed the bounty, and got a pretty powerful rocket launcher as a reward. 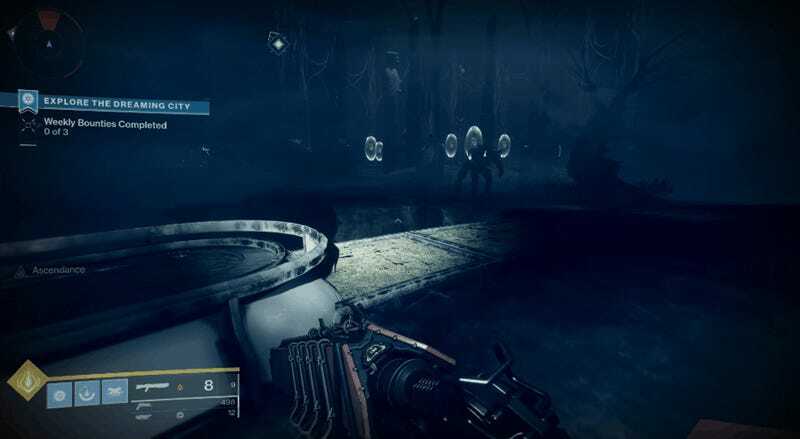 That strange, stressful Ascendant encounter embodies one of my favorite things about a new Destiny expansion, particularly one as full of secrets as Forsaken has so far proved to be. I love the feeling of going where I’m not yet supposed to go and doing things I’m not yet supposed to be able to do. I love how players will come together online to share tips and strategies, and how we collectively bend the game to our will. I think back to running, alone and underleveled, through the Thrall maze in the first Destiny’s Crota’s End strike, following an elaborate mental map to see if I could survive the first phase. Destiny is ostensibly a series about fearlessly exploring unknown worlds filled with terrifying aliens, but only rarely does it actually feel like that’s what I’m doing. There will soon come a point when I’m high enough level that the Dreaming City won’t seem so threatening. There will also come a point when I know all the Ascendant Challenges, and everything else in the City, like the back of my hand. My character will be powerful enough to fight his way through those Knights straight-up, instead of running away. I’m sure that’ll be enjoyable in its way, but it won’t have the same air of danger and experimentation. Now, at the beginning, is when players are equally underpowered and underprepared. Destiny won’t feel this daunting again for a long time. Destiny players around the world have already begun charting the Dreaming City and cataloguing its secrets, steadily converting it into a known quantity. By October, we’ll likely have uncovered everything there is to see. For these first few weeks, however, mysteries and dangers beckon. After a tease in Sonic Forces' E3 2017 trailer, Sonic fans can get a closer look at the game's mysterious antagonist: Infinite.